Jeff Dalton is a Certified SCAMPI Lead Appraiser, Certified CMMI Instructor, ScrumMaster, author, and consultant with years of real-world experience with the CMMI in all types of organizations. Jeff pioneered agileCMMI, the leading methodology for incremental and iterative process improvement. He has taught thousands of students in CMMI trainings and has received an aggregate satisfaction score of 4.97 out of 5 from his students. Visit www.broadswordsolutions.com for more information about engineering strategy, performance innovation , software process improvement and running a successful CMMI program. To download eBooks about CMMI, visit Jeff’s Author Page on Amazon. Why should we care if management cares about how we work? We're Agile! Hey, CMMI Appraiser, we’re a self-sufficient Agile team. What should we care if management cares about how we’re doing our work? ~ Michael R.
I believe you are reacting to my comment on the webinar that, for an organization to be successful in using the CMMI to strengthen Agile, your management needs to care about how you do your work. In my opinion, this is a big mistake. How we do our work is everything, and I tell them so. And I’m telling you, too, Michael: If you don’t have a well defined WAY that you do your work, it’s like wearing a boat anchor on your back that you are forced to carry through every single project. 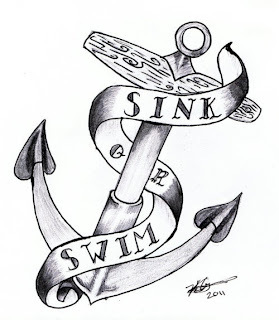 What do I mean by boat anchor? It’s really darn hard to do the most basic things. Important details fall through the cracks. Projects are late. We have disorganization projects, and some projects don’t even start. Important events don’t happen. Or projects get stopped and cancelled. The boat anchor creates so much weight that you can barely deliver a product. The problem with this is it makes management feel even more out of the loop. Then they want to institute even more oversight. That’s not what you want. You want them to care about the way you work – what we call “the Way” your work gets done – not change it. This is especially for an Agile team. You need management to understand your Way of doing things, and how it meshes with your Way of doing business as a company. The way this CMMI appraiser sees it, defining the Way you work is the most important thing you can do. How we work, how innovative we are, how organized we are -- all of these factors are what makes us a great company, as opposed to a company that is just a good company. A good company has great people. A good company has great technology. A great company has great people, great technology, AND they have a Way of doing business. What’s in it for you? When your Way is well defined, when your processes are shipshape, the boat anchor comes off your back. You get to all do the things that you signed up for, which was to write cool software, work with great clients and create amazing products. You can’t do that with a boat anchor on your back. For those who may have missed the webinar, you can watch the REPLAY of "Agile Resiliency: Scaling Agile So That It Thrives and Survives” any time. According the CMMI Institute's latest "CMMI Maturity Profile Report," small organizations with less than 500 employees are dominating the market with CMMI Adoption. The most interesting piece here is that almost HALF of all organizations adopting CMMI are less than 100 people! I've written about this in the past when I wrote about how the CMMI is more beneficial for small, agile organizations than for large ones. How fast can we get a CMMI certification? Hey, CMMI Appraiser, we’ve got some chronically unhappy customers who are looking at other vendors who are CMMI certified. My boss needs to know how fast we can get a CMMI certification so we can demonstrate our commitment to process improvement planning. What can I tell him? ~ Paul V.
You can’t EVER get a “CMMI Certification” because there’s no such thing! Now, your boss isn’t the first to use the phrase “CMMI certification.” It's pretty common in the industry vernacular. But the folks that govern the CMMI would prefer that we use words like “achieve a rating” or “achieve a Maturity Level” when referring to the desire to be sufficiently equipped with the infrastructure and tools that you need to become a great company, using the CMMI for guidance. That’s more than just a shift in terminology, Paul; it's a shift in mindset. The reason to go through the investment, time and energy of adopting the CMMI is because you want to transform behaviors and become a great company. If you put a “certification” mindset around that, you’re going to drive all the wrong behaviors. So your boss is asking you to look for a quicker way to reach the company’s goals. Your competitors have achieved a CMMI Maturity Level, and your clients want proof of your commitment to continuous process and performance improvement. The first step is to find a CMMI consultant who understands that so-called “CMMI Certification” or achieving a CMMI Maturity Level should NOT be your goal. Unfortunately, that’s the focus of many "appraisal mill" type companies. 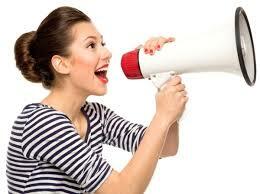 They see no value in providing advice, strategy, and helping to ensure that you get the results you were hoping for. They just want to sell you the appraisal. This CMMI Appraiser believes it’s far more useful to you to work someone who helps you understand culture, helps you communicate vision, and helps you learn how to be a great company. That way, when the timing is right, your company will achieve a rating. But this is a path that goes beyond mere discussions about CMMI certification. Helps you set the right goals and objectives, and asks the right questions that keep you on the path to continuous improvement. When your boss sits down with this kind of CMMI Appraiser, he will come to understand that the CMMI is far too valuable and useful to focus on so-called CMMI Certification. It’s not about racing to the finish line. It’s about things like how well you are running your engineering division, how well you are delivering products, and how happy your customers are. And by the way, in case you were wondering ... yes, there really can be such a thing as happy customers. When is Broadsword speaking at SEPG NA 2013? Last year I heard you speak at SEPG NA in New Mexico. You talked about how going through the CMMI Appraisal process is more about organizational performance improvement and less about getting a “CMMI certificate,” which doesn’t exist anyway. Will you be speaking again at the SEPG conference in October? If so, when? I'd like my managers to attend. ~ Mary S.
Yes, I’ll be there! For the 8th consecutive year, Broadsword has been selected to speak at the SEPG North America 2013 Conference on October 1-2, 2013 in Pittsburgh, PA. This year promises to be even better than ever. I will be introducing a concept I call “Agile Resiliency” – a strategy for helping engineering and software professionals be more Agile, and make Agile even stronger with the CMMI -- and there will be presentations by some of the most influential thinkers in the industry. So invite your managers. Invite your clients. Spread the word! I’m thrilled that you remembered the key take-away from my speech last year, Mary. In many companies, as you are experiencing, there is a tendency among executives to focus more on “CMMI certification.” As you said, this is a misnomer – there’s no official CMMI certificate. Well, the CMMI Institute wants you to be a great company. They want your clients to be great companies, too. That's why they worked so hard to put together an outstanding slate of speakers this year. The itinerary has not been released yet, but whichever sessions your executives attend, they will gain valuable perspective on the CMMI. You’ll be able to go back to your company afterward and start to drive the changes you are seeking. Looking forward to seeing you and your executives in Pittsburgh, Mary – and please be sure to introduce yourselves! What’s the difference between SCAMPI A, SCAMPI B, SCAMPI C? 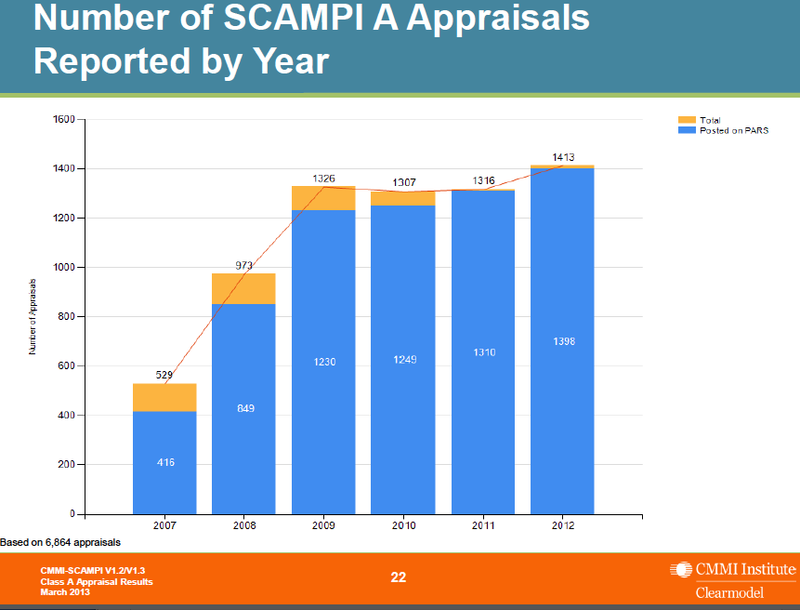 What is the difference between a CMMI SCAMPI A, SCAMPI B and SCAMPI C appraisal? Do they correspond to the CMMI Maturity Level ratings? For example, do we slot to the SCAMPI C, since we want to be a CMMI Level 3 organization? ~ Lisa A.
Hi, Lisa. No, there is no correspondence between the two. An organization can be appraised at Maturity Level 2, Maturity Level 3, ML4 or ML5. But the only class of appraisal that results in a “maturity” rating is a SCAMPI A appraisal. Below are more distinctions between SCAMPI A, SCAMPI B and SCAMPI C ... just in time for lunch! 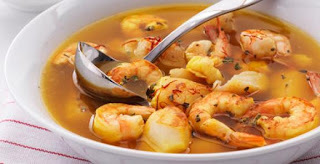 SCAMPI A , as I said above, is the only class of the method that results in a "maturity" or "capability" rating (such as CMMI Maturity Level 2 or CMMI Capability Level 3 in Project Planning). What’s more, a SCAMPI A is a team-based event which is led by an external "SCAMPI Lead Appraiser" who has been certified by the CMMI Institute and Software Engineering Institute (SEI) to perform SCAMPI Appraisals. SCAMPI B is also a formal appraisal – albeit less so. This CMMI appraisal serves as a tool to give you the information you need to completely understand your current state in relation to the CMMI. In particular, you’ll have enough information to decide whether you are likely to succeed in the formal SCAMPI A. To be clear, SCAMPI B is an important and highly useful appraisal; it just doesn't result in a rating. SCAMPI C doesn’t result in a rating either. But it is tremendously useful too. The SCAMPI C is first and foremost a way for your company to find out about itself and how you stack up against the CMMI model. It’s also an opportunity for your CMMI Appraiser to learn as much about your company as he can, and for your company to learn about the CMMI Appraiser. This is important because you will be spending a lot of time together, generally a year or two, making decisions that will have an serious impact on the behaviors of your people. And so, helping both sides feel more comfortable with each other is one of the most beneficial aspects of the SCAMPI C.
As a SCAMPI Lead Appraiser, it's my job to lead a team that evaluates process performance across your organization against the required components of the Model (the Goals) and the expected components (the Practices). Either way, you should start working with a certified Lead Appraiser early - long before you desire to conduct and appraisal. That way, you’ll have a track record together when you are ready to begin your SCAMPI A journey. Because that’s what this is, a journey. CMMI isn't a paper-chase. It’s not about getting a so-called “CMMI certification.” It's about making your company great. Being CMMI Maturity Level 2 or CMMI Maturity Level 3 doesn’t in itself make you a great company. But it does mean that you are sufficiently equipped with the infrastructure and tools you need to become the great company you want to be. Can we use Agile to deploy Agile? Hey, CMMI Appraiser, we are having a disagreement on our team and we're trying to remember what you said on the webinar. Can we use Agile to deploy Agile? ~ Jorge A. Absolutely, you can! Why not? On the webinar, I spoke about the methodology we call AgileCMMI at Broadsword, and that’s exactly what we do with all of our clients. We help them roll out Agile methods using Agile methods to help organizations deploy whatever they want to deploy. Since pioneering the concept, we’ve seen the AgileCMMI methodology develop into a well-defined, mature method for continuous improvement in technology organizations worldwide. Companies large and small are using it – and you can too. In addition in the projects that we run in our client engagements, I use this method to teach my CMMI training courses. 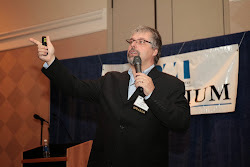 In particular, I use Scrum to teach a class called Scrum Plus CMMI. Class participants get a Scrum board, with columns for “to-do,” "doing," and “done,” along with user stories and story points and all of the things that you would expect on any Agile project. This is significant because one of the keys to success in performance improvement, or process improvement planning, is to provide resources that make sense for the project. Management needs to provide the right tools and environmental resources (i.e., facilities) to deploy Agile values, methods and tools. Providing the right resources is how to ensure that the deployment is useful, and that your team can be successful. My answer was, “Well, we could do that, but it'll be pretty tough with a small chance of success." Instead of launching into the deployment, I got them thinking about the need to have some cultural change in the organization. They are currently working to develop resources like mobile team room and moveable Scrum boards. They're doing some cool stuff with iPads mounted on moveable stands (like you see in a hospital) with Skype running on them. We are helping them adopt a new Way of doing business, rolling out the changes iteratively and incrementally. That’s the cool thing about using Agile to adopt Agile. The approach allows you to build Agile processes incrementally, pilot them and learn as you go. You get to try them out, get feedback, determine what changes are needed, and deploy them all in a structured, iterative environment. If you are interested in learning more, Jorge, consider taking a CMMI training course that is related to CMMI, Scrum, or general process improvement. The CMMI Institute offers many such courses. Look on our website for courses we are offering. Meantime, feel free to register for a REPLAY of "Agile Resiliency: Scaling Agile So That It Thrives and Survives” and watch it again at your convenience. Why do we have to state what our values, methods and techniques are? We’re Agile! Hey, CMMI Appraiser, Why do we neede an organizational policy? We’re Agile! ~ Becky R.
Your question came at a point in the webinar when I was talking about the practice in the CMMI that guides companies to establish an organizational policy to set expectations for everyone who will be performing the processes. In translation, then, your question becomes, “Why do we have to clearly state our values, methods and techniques, if we’re Agile?” And my answer: Because you want to win! Clarity helps you win. If you don’t have clarity on what to focus on, you become like a sports team that has lost sight of its mission. The result can be a comedy of errors. Of course, on a real soccer team – or any team sport – the players would never dream of taking the field without having clarity around their values, methods and techniques. Yet, here in the software industry, we’re different. We often just run out onto the field and start flailing away. The ball bounces around, and five of us bang into each other, trying to get it. We suffer a lot of bumps and bruises. 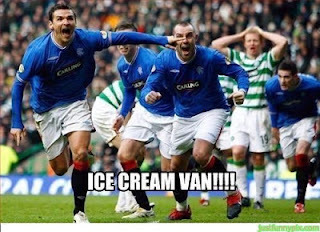 Ultimately, we’re happy just to make it to the ice cream party, after the release. Sure, I’m exaggerating – a little. But at some point, most of us have seen this type of chaos in our software development projects. It happens when we don’t have the absolute clarity to focus on what’s most important to our business, our process, and our product. This is incredibly important, especially when applying the concept of using tools like the CMMI to strengthen Agile methods, as discussed in the webinar. Try it today, Becky. Try establishing clarity around your values, methods and techniques, and see if it doesn’t give you an immediate bump in performance. With practice, you will be able to position your team to go forward with this type of clarity every time you take the field. More often than not, you’ll walk away a winner. Did you miss the webinar? Click the link to register for a replay of "Agile Resiliency: Scaling Agile So That It Thrives & Survives.” And, as always, feel free to submit any questions! 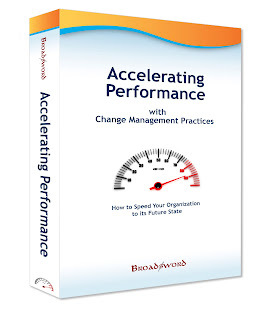 “Accelerating Performance” eBook Is Now Available! If there’s one constant in the world of engineering and software development, it’s change. Now more than ever, business leaders and professionals are embracing change by learning to use tools like the CMMI to help them adopt new behaviors and establish the type of environment that can make them part of a great company. What’s the best way to establish those new behaviors quickly, with minimal disruption to the organization? The answer can be found in our new eBook, “Accelerating Performance with Change Management Practices,” now available to download here. 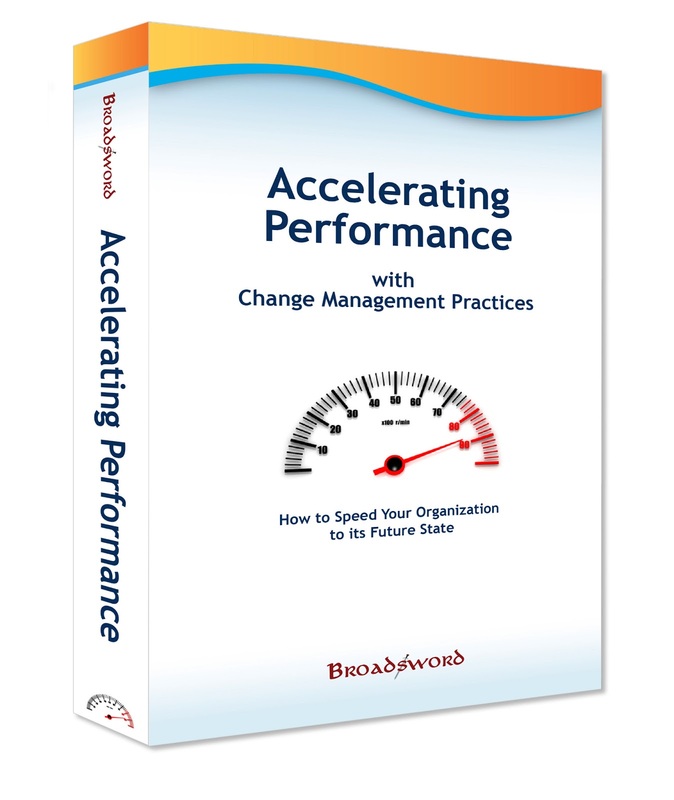 Written by this CMMI Appraiser and our Change Management Coach (Broadsword Solutions’ Director of Consulting, Julie Calfin), “Accelerating Performance with Change Management Practices” is designed to help the leaders of organizations be successful in process improvement planning or performance innovation planning. The book is an excellent guide for anyone planning any type of companywide transformation that requires a change in people’s roles, jobs or structure – or all three. “Accelerating Performance with Change Management Practices” is based on inquiries about Organizational Change Management (OCM) made right here at Ask the CMMI Appraiser. We share our experiences leading organizations through performance improvement and change management initiatives, based on Broadsword’s structured agileCMMI approach. So check out “Accelerating Performance with Change Management Practices: How to Speed Your Organization to Its Future State” -- and please feel free to write a review! Change Management Coach Julie Calfin is the Director of Consulting at Broadsword Solutions Corporation. She has years of real world experience using OCM strategy and tactics to help her clients achieve their goals. Julie also uses the CMMI, in partnership with her clients, to set-up, monitor, and sustain process improvement programs. To download more eBooks about CMMI, visit Jeff’s Author Page on Amazon. Are some practices in CMMI “more equal” than others? Hey, CMMI Appraiser – we are an Agile shop preparing for our first CMMI Appraisal. Is it true that some practices in the CMMI are more important than others? 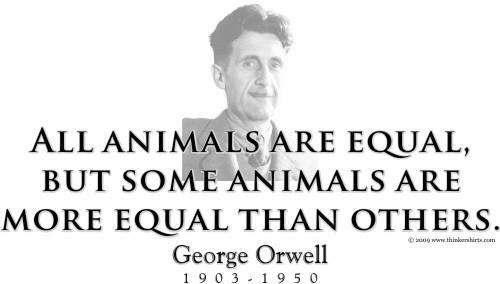 That sounds a little Orwellian to me. If it is true, how do we determine which practices to focus on? ~ Frederick L.
Similarly in the CMMI, some practices are more important TO YOU than others. So how do you know which practices to focus on? It depends on your particular context. Every company has its own set of priorities, which is one of the reasons that CMMI appraisals can be quite difficult. Context means everything. Does the process we’re going to adopt include things like failing fast, iterative and incremental ways of running the project, and collaboration between teams? Does the process include using information radiators and all of these things that we know are true about all Agile methods? Think of this level of the Agile Resilience Architecture as your foundation. Use it to be sure you are letting your values guide your work. The second tier of the Agile Resilience Architecture is the method or framework for managing the work of Scrum. The CMMI is an excellent task-management system that takes into consideration a way to sequence or prioritize things. Over time, it helps you transform your company culture, and manage the change. As you complete your SCAMPI A, you will gain more familiarity with how the CMMI is a framework for transforming your company’s culture, and putting you on the path to greatness. Tier Three of the Agile Resilience Architecture describes doing the work. This includes Planning Poker, Continuous Builds, Story Time, Backlog Grooming, Retrospectives, etc. Everything you do as an Agile shop, and the way you do your work, is part of your particular context. So those are your three layers, Frederick. You’ve got your Agile values, your methods and your techniques. My recommendation, as you are building this resiliency model, is to clearly separate the three tiers. Get a clear mental picture of each, and their position within the Agile Resilience Architecture. Without the guidance of the Agile Resilience Architecture, it becomes all too easy to lose sight of what’s most important. So that’s why we say some practices in the CMMI are more important than others. Rather than looking for 346 practices to check-off, take a look at your Agile methodology through the perspective of the Three-Tiered Agile Resilience Architecture. Not only will you be able to focus clearly on your values, methods, techniques -- but you’ll be on your way to a highly rewarding journey of continuous improvement. Watch this space for a replay of our recent Webinar presentation of "Agile Resiliency: Scaling Agile So That It Thrives & Survives."